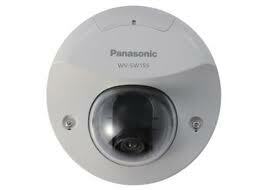 The new WV-SW155 IP dome camera is the latest offering from Panasonic in IP vandal resistant dome cameras. The camera boast several features that are aimed to enhance the iPro range. The WV-SW155 IP dome camera has the ability to stream both JPEG and H.264 at up to 30 images per second and has true day/night functionality. The WV-SW155 IP dome camera comes in a vandal resistant body and is IP66 rated. It also produces images at 720P making definition sharper. With facial detection also a key feature this IP camera has the ability to offer end users excellent all round performance. With increased storage now available in the WJ-NV200 NVR, the WV-SW155 IP dome camera and Panasonic’s quality NVR make the perfect combination. This entry was posted on Monday, November 28th, 2011 at 19:35	and is filed under IP cameras. You can follow any responses to this entry through the RSS 2.0 feed. Both comments and pings are currently closed.